Phone calls were down the week after Easter according to most agents we’ve talked to. Some say the roads are easier to travel and some still see busy traffic. We noticed heavy traffic at the beaches the week after Easter and still heavy on Sanibel and Captiva Islands this past week. 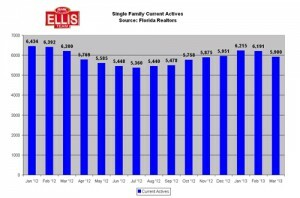 April SW Florida Real Estate Market Update. The Ellis Team sold so many listings during season we didn’t even have enough to fill an ad. This past week or two listing calls have picked up and we are listing again. It’s no wonder we’ve seen price gains as inventory has dropped a bit. As you can tell from the inventory chart, single family home inventory is down below last year’s numbers. It will be interesting to track and see if April’s numbers fall below last year’s numbers. I suspect they will if our Team numbers are any indication. If April numbers do drop we’ll have to wait and see if we test market lows in July. Lower inventory has led to higher prices. Average sale price numbers dropped just a bit from February but they’re still up 12.8% over last year’s numbers. 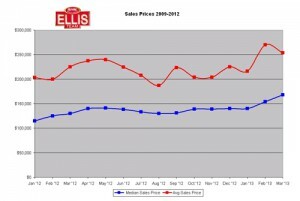 Median sale prices continue to climb, up 29.2% over last year and up 9.17% over February of this year. Last year median sale prices rose through April then leveled off before rising again this January. We’ll continue to watch that trend this year as well. As you can see from the pricing graph, average sale prices dropped from May through August. This is not unusual as many higher priced properties sell in season. We’ll keep an eye on average and median sale prices the rest of this year. This past week I worked on a condo listing at The Club at Crystal Lake, which is a nice condo project in South Ft Myers. I was able to pull up sold comparables but it was interesting that there were no active listings on the market. The only listing was an active contingent short sale which means they’re waiting on the bank to approve or deny a short sale. It was rather strange to not find one available listing on the market. And so it goes in some communities. There just isn’t the inventory we used to have. Buyers from up North are disappointed when they find out their criteria is too restrictive to match any properties. We had one buyer come to us who fired their Realtor because they weren’t working to find them properties. We had to educate them that their Realtor wasn’t doing a bad job and that their expectations were not realistic. What they wanted today doesn’t exist at that price range. It did a few years ago but the market has passed them by. Just yesterday I received a buyer lead looking for a 55+ community up to $100,000 within walking distance to the beach. I assigned the lead to one of our buyer agents. Without doing the MLS search myself, my guess is it will be hard to fulfill those demands. The bottom line is the market is on the move. If you’re interested in buying or selling it pays to watch the trends. You never want the market to pass you by. Now may be the time to move on those wishes. Waiting today may mean you’ll be waiting next year because you can’t afford the new market reality. If you’d like to sit down and discuss your options, give us a call at 239-489-4042 It might be a better idea to have a conversation this year versus next year. Good luck and Happy House Hunting! Posted in Southwest Florida Real Estate.Tagged April SW Florida Real Estate Market Update, MLS search, Sanibel and Captiva Islands, The Club at Crystal Lake.